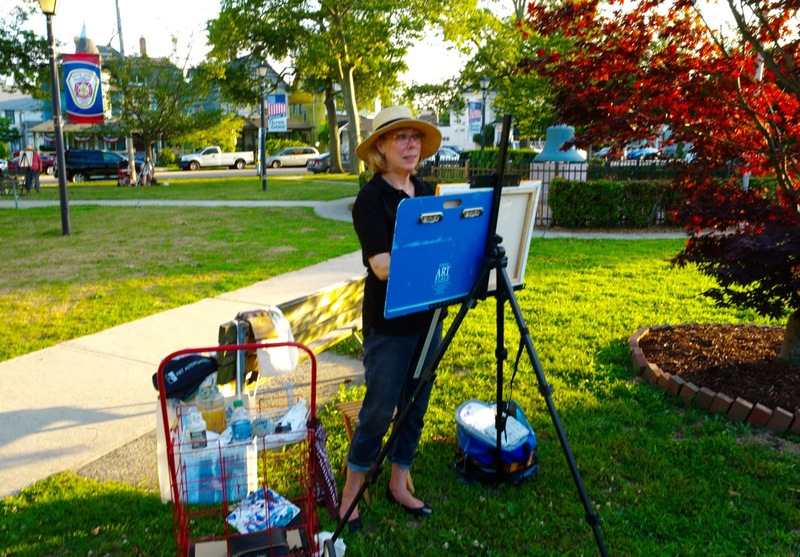 « Soon it’s gonna rain…..
Painting outdoors (“en plein air”)—-an idea that brought art out of the studio and into the light and fresh air. “En plein air” has been popular since the days of the Impressionists. The French thought of it, and that is why we say,”en plain air” instead of “open air.” The idea is that the artist experiences the actual conditions of light by setting up his (or her) easel and experiencing reality. It should give the finished work a more “au naturel” look. This Friday, July 15, we found that art professor Norma Tolliver had brought an intermediate class of acrylics painters to Firemen’s Park. We spoke to Janet Whritner of Ocean Grove who was part of the group which had set up throughout the park. She says that she is at an intermediate level having taken some classes before. In fact we met “JW” last year when she and Beverly from Mt. Tabor Way had camped out at the feet of Rev. Stokes for the same sort of painting-in-fresh-air experience as now. Norma is the artist-in-chief at the Main Avenue Galleria. Her art school provides a wide choice of classes including some for children. On August 13, they will have a “paint around,” sort of like musical chairs where all the participants get to contribute at each canvas. Do they all sign the finished product? Can you imagine doing that while cooking, soloing on an oboe, or composing a symphony? But Norma must make it work—this will not be her first rodeo. So, when is the class over? When the light fades, of course. Then the class gets together for some close harmony below. Listen for Janet—the soprano; Beverly is the alto and Norma conducts with a brush in her hand. We do need a tenor–can someone lend us a tenor? Maybe Ron Naldi would join the group? And how about a bass? After all, it’s all about the bass. Rufus Wainwright, Martha Wainright, and the McGarrigle sisters.